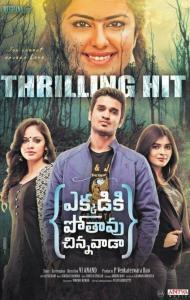 Arjun (Nikhil) goes to Kerala for his friend ‘s (Vennela Kishore) psychological treatment. While in Kerala , Arjun comes across Amala (Hebah Patel) ,who is also a telugu girl, and falls in love with her. Later after returning to Hyderabad, Arjun realizes that the lady Amala is not a human but a spirit who has taken over Nitya’s body. Meanwhile, Amala’s spirit leaves Nitya’s body and enters into another lady Parvathi (Nandita Swetha) ‘s. The story looks illogical on paper, but director Anand narrated it convincingly. Rest of the story is how Amala’s sprit tries to get close with her Lover Arjun who is still alive.